*Fans of the Style series “Tia and Tamera” got an early peek at Tamera Mowry-Housley in GMC’s “Christmas Angel,” which she filmed earlier this year in New Orleans with cameras from her reality show in tow. “I was four months pregnant while doing it and shooting the reality show – and in some humidity. It was quite interesting,” Tamera told us back in August during interviews for the film. Her newborn son with husband Adam Housley is due any second, while “Christmas Angel” will make its debut on Nov. 24 and 25 to kick off the holiday season, with co-stars Della Reese, Teri Polo, Kevin Sorbo, “American Idol” vet Mandisa and newcomer Izabela Vidovic in an inspirational story of hope, wishes, reward, and Christmas miracles. The plot follows a young girl’s wish for a complete family. While writing a class paper on “My Impossible Christmas Wish,” Olivia Mead (Izabela Vidovic) quickly takes note of unusual happenings going on around her. As her wishes come true, she is convinced the miracles are linked to a mysterious woman she believes is an angel living in the house across the street. 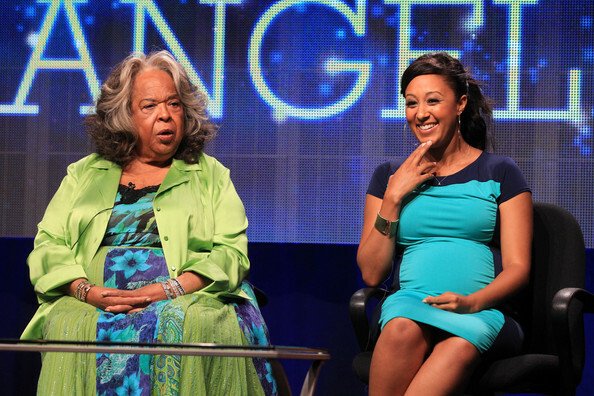 Mowry put in four days of work as Daphney, a bakery owner and mother of a 10-year-old son named Lucas. Below, she says the role ended up being a practice run for her own impending motherhood.